– Cloned a bra for my Aunt Bonnie, in preparation for my next big project for her. – Altered a suit jacket for my Mom. – Altered a lined dress for my sister. – Made, from scratch with patterns I drafted myself, a skirt and blouse for my Mom (which I neglected to photograph; many apologies). – Sewed a muslin for Bonnie’s next big thing. 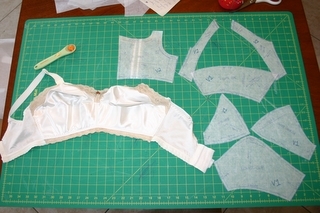 – Drafted and sewed up a second stunning bra for C.
– Sewed a swaddle for a store that carries baby gear and which will likely hire me to do more sewing for them. – Accepted a **paying** job to sew some custom purses, and completed the first of them. – Spent hours upon hours hand sewing tiny little glass seed beads to the piece of fabric which will eventually be the bodice on a dress. Now, some of you may want to know what has inspired so much obsessive sewing (and remember folks, I also worked 40 hours a week and commuted 10 and spent time with my 2 year old daughter and my husband, in between all the sewing). Here’s the short version: I’m going pro. I’m not there yet mind you, but I am working hard to complete my current commitments, and just as hard to take on more business, so that I can actually have a home based business. Which I need at this point to supplement my dwindling real estate income, and which may eventually make it possible for me to at long last become a stay at home Mom!!! Those last words are honestly all the motivation I need to do anything. I would move moutains, stop time, perform the twelves labors of Hercules by my mortal self, just to be home with my daughter. And honestly, can you blame me? Check back later today. I plan to have a few photos up at least. I have an actual logo now! (Many, many thanks to my amazing husband for that). Business cards are on order and will arrive soon. I feel like an actual legitimate business! Ahem, is it still Sunday? Okay, so I know I said I’d post my pick for the dress form’s new name on Sunday, and then I didn’t. It’s been a bit hectic and I’ve been without a computer for large periods of time. But, here I am now! Of the names suggested to me, Sally is my favorite. So, Sally it is!